As the White House Moves to Develop a New Generation of Nuclear Weapons, Dr. Helen Caldicott Speaks on Nuclear Proliferation and the Invasion of Iraq | Democracy Now! The Bush Administration came a step closer to developing a new generation of nuclear weapons when the Senate voted to repeal a 10-year-old ban on research and development of low yield nuclear weapons. The Pentagon wants to build more so-called “mini-nukes” which have a blast equivalent of about one third as large as the Atom bomb dropped on Hiroshima. Advocates of the bill say the weapons could target enemies more precisely while limiting civilian casualties. Opponents say it will undermine efforts to discourage nuclear proliferation around the world. One of the most impassioned advocates for nuclear disarmament is physician, humanist and Nobel Peace Prize nominee, Dr. Helen Caldicott. Dr. Helen Caldicott has devoted the last 30 years to an international campaign to educate the public about the medical hazards of the nuclear age, and the necessary changes in human behavior to stop environmental destruction. She founded and headed Women’s Action For Nuclear Disarmament and Physicians For Social Responsibility. 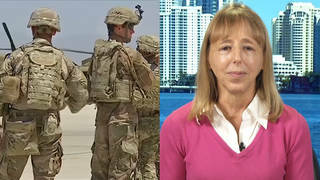 She has written for numerous publications and has authored five books, the latest of which is The New Nuclear Danger: George Bush’s Military Industrial Complex. She spoke two days ago on nuclear proliferation, the Bush administration, and the invasion of Iraq.